with some information from more recent times by John Creasey. From Saxon times this Church had two Rectors, one of whom is mentioned in Domesday Book as having ten acres of glebe land (half a Church with ten acres), but by 1280 each had a house and fifteen acres. No signs of the Saxon Church survive, and it may indeed have been constructed of timber framing. One would expect its nave to be shorter than the present one. It stood on the estate of Edrich, being held by a freeman of his, named Viulf. 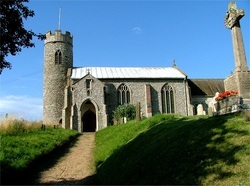 Having deprived Edrich, William the Conqueror gave the estate to William Earl Warren, and the Church appears to have been rebuilt in flint before the end of the Norman period. Its nave, to be more in scale with the existing chancel, would come entirely within the present nave; the ledge on the west wall indicates the height of its side walls. To this nave, in about 1200, the round west Tower was added. That it was lower than now is shown by one of its belfry windows, which partly survives below the nave roof. Reconstruction of the upper part of the tower in 1912 has obliterated all traces of the other windows. At the same time a south doorway, that had been blocked for centuries, was re-opened. Its existence suggests that, as in some neighbouring towers, the lower stage was intended to serve as a vestry. The doorhead, of two stones leant together, is cut to form a pointed arch, and rests on two slabs, The jambs, however, are of flint, as no doubt were the angles of the nave and much of the other openings, cut stone being kept to a minimum, so that re-use cannot be detected in the later walling. Two windows with forked- mullion tracery are presumably part of the thirteenth-century improvements, later reset in different positions. They imply alterations, perhaps consisting of a north chapel attached to a chancel, rather westward of and overlapping its present position. The most remarkable feature of the building is the South Doorway with unusually complicated castellation on its capitals. This might refer to John of Gaunt. He was the first Duke of Lancaster to act as patron of this Church. In 1371, after presenting two new Rectors, he married his second wife, Constance, and through her inherited the crown of Castile and Leon in Spain, in succession to her father. In 1376, when presenting another Rector, he is called ‘John, King of Castile and Leon’. Though one cannot prove this intention, a reference to the patron’s unique distinction would not be out of place at the main entrance to the Church. The arrow-slits that occur on the capitals, and the battlements rising to two different heights, are marked features on the coat of arms of Castile. After seventeen years the Duke resigned his kingdom without ever having governed it. The doorway and contemporary west windows on either side of the tower would have been built into the side walls of the narrow nave. The more conspicuous window of the two is supported outside by little octagonal corbels below the roll mouldings, again a most unusual feature. Just previously, the Chancel was rebuilt, still using ‘Decorated’ designs in the windows. The east window and buttresses are identical with those at Gresham, and the same window-design occurs in Acle chancel which can be dated 1362 (Norfolk Archaeology, xxxii, 124).The piscina and sedilia, with bowed ogee arches, show the same little round face in the canopies as the stoup next to the blocked north door of the nave. They contrast with the rather later piscina for a nave altar. The stoup is said to have been found by Bishop Stanley behind plaster in about 1840. Its bowl for Holy Water has been partly destroyed. A former narrow vestry on the north has left traces of its walls near each end of the chancel, with remains of plastering between. Major alterations took place in about 1400. In that year Thomas Langhale, Rector of one mediety, left 3s. 4d to emend the Church, and Robert Pers, Chaplain, left 2s, for the fabric, when a normal wage was 6d. a week. As at Felbrigg, twenty years earlier, the nave was rebuilt wider and higher, and covered with a low- pitched roof, all still surviving. This involved reducing the north chapel, now a ruin, whilst the chancel arch was enlarged. Finally, the belfry had to be raised to clear the new roof. Sir Simon de Felbrigg, who in about 1380 succeeded his father, Roger, as lord of the manor, and in 1395 became standard-bearer to King Richard II, would be largely responsible for these alterations. He was buried in 1442, in the Blackfriars’ in Norwich, but at Felbrigg is a fine brass to him and his first wife, Margaret. She was daughter of the Duke of Teschen, and maid-of-honour to the Queen, Anne of Bohemia (1382-94). A Parish-boundary Cross stands at the cross-roads, under a mile to the south, and dates from about 1400. The South Porch followed the nave (the gables of both have the same details), but was at first without the upper floor, which cramps the space for a carved saint over the door. The upper storey and stairway are an afterthought of perhaps 1420, when John Baxston, Rector, left 26 ounces of silver to emend the Church, and 40 ounces to emend the books or whatever was most needed in the chance!. One concludes the rebuilding was practically complete. A drawing at the Castle Museum, Norwich, in the Todd Collection, shows the medieval iron-bound door of the stairway, and the thirteenth-century octagonal font of Purbeck marble on the incongruous high plain base, as they existed early in the last century. The Rood Screen probably dates from 1445, when John Baker left 10s. to the Church fabric. He had been Rector, first of Aylmerton, and subsequently of Felbrigg. The screen has lost its ‘loft’, which was reached from the north chapel by the blocked stairs, both doorways being still visible. The upper doorway, over the pulpit, is of plastered brick. Though the spiked finials, rising one over each half of the main ogee-headed openings, are original, the knobs below each pair of arches are later, and the lower parts of the screen are much renewed. The old stout bench-ends in the chancel are provided with three pricket holes for lights instead of the usual single hole. In 1493, William Feren, Chaplain of Dundry in Somerset, died at Aylmerton and left 20s. to the repair of the Bells here. None of the medieval bells survive, but one of 1600 is by William Brend of Norwich. There has been little later alteration to the structure apart from a new roof to the chancel, in about 1785 to judge by its resemblance to the roof of Felbrigg chancel. There, an inscription on the south wall-plate states ‘G.W. Lukin 1785’. He was Rector of both parishes, 1764-18 12, and of Runton from 1788 when the latter was united with Aylmerton. He was also Prebendary of Westminster from 1797, for two years, and then Dean of Wells until his death in 1812. The earliest memorial is in the chance!, to ‘Mr John Reeve of the City of Norwich 1732’, though two earlier thirteenth-century stone coffin-lids (?) are near the south porch. The Church was restored in 1865, and again in 1876, and in 1912 the upper part of the tower was rebuilt to the old design, re- using the old stone and flints. The 1876 restoration was by W.W. Mills, Rector, 1872-1915, whose memorial on the south wall shows the paten and chalice from Runton; the organ also came from there. The font, pews and furnishings, with pitch-pine additions to the roof, are of this date, but the best item is the inlaid Communion table of 1876, given by the aunt of R.W. Ketton-Cremer who left Felbrigg Hall to the National Trust in 1969.